I integrated Ads Interface from http://docs.giderosmobile.com/interface/ads in my Android Studio project, but trying to run on my device it crashes. It didn't before integrating Ads Interface. Can anyone understand the error log? @vyh77 it could happen if you support some platform as armv6 or x86, etc but don't have ads binaries for them. is libads.so in every directory of your libs directory of your exported project? @jdbc I downloaded it yesterday. it seems they are in the wrong place then. They should be in the same directory, where libgideros.so files are. Error:(58, 28) No resource found that matches the given name (at 'value' with value '@integer/google_play_services_version'). Error:(58, 28) Execution failed for task ':app:processDebugResources'. @vyh77 your previous post does not really indicate any error, well it has error, but right after it there should be more information about it, but in your case thats were the log stops for some reason. About "No resource found that matches the given name (at 'value' with value '@integer/google_play_services_version')." Checking on internet, every developer has solved it in a different way. A question, has the Ads Interface been tested on Android Studio? 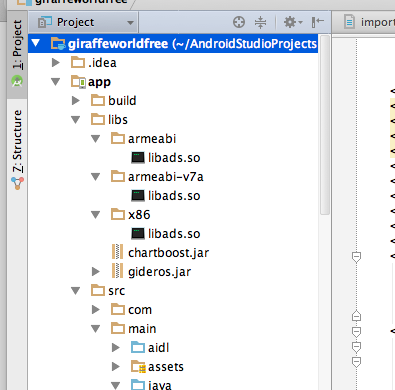 I have not used Android Studio, so no it have not been tested, but it should not matter, that's just an IDE. But maybe the error that should follow is showed in some other place?